Was really surprise at how funny these books are and how clever.Lots of laugh out loud moments and just great fun!Thankfully there are lots more to read! "You don’t analyse such sunlit perfection, you just bask in its warmth and splendour. "- Stephen Fry aka Jeeves Along with a dictionary and some lemonade. The bright lights that put together these 5 Jeeves and Wooster omnibuses did so in an extremely non-chronological order, probably so that you'd have to buy a number of them to get the best books. Unfortunately, to get the full joy of the series you really have to read them in chronological order -- which I why I have all 5 books on the go at once.I've now finished the first anthology and, as with many, many people before me, I think that Pelham Grenville Wodehouse is brilliant. Many laugh out loud moments, much superbly wrought prose. The only real reservation I have to the books is the feeling that almost all of the characters should be taken out and shot: what a bunch of utterly worthless shits. Still, that's where so much of the humour lies. Current favourite lines (badly remembered, no doubt): " He was so fat that tailors would measure him just for the exercise." "The yacht was big, about the size of a young liner. "One caveat: these books are like a very, very rich dessert. They are tremendously enjoyable but you mustn't read too much without a break. It's best to enjoy one book, then cleanse the palate with something else before trying another. Three good books including the best I've read from the world of Jeeves and Wooster.But too much light hearted comic relief wears after a while and I struggled to get around to reading the last chapter of Code of the Woosters. I find the stuff good... but not that good. Feeling jaded; I'll think long and hard before I try one again... and they're all pretty much the same anyway, all blurring into one long collection of frail social predicaments and misunderstandings. I think this is going to be the beginning of a bad habit for me. Short review: glorious collection of three Jeeves and Wooster novels.Long review......Thank You, JeevesMy first exposure to Wodehouse's "mentally negligible" but good-hearted and engagement-prone Bertie Wooster and his more than capable valet Jeeves came thanks to the early 1990s ITV television adaptations starring Hugh Laurie and Stephen Fry. First watched on a Sunday evening, much-loved and later bought as VHS boxed sets, I've seen them all dozens of times. It's almost impossible for me to think of Bertie as anyone other than Laurie and Jeeves as anyone other than Fry.Luckily, those TV adaptations captured the spirit of Wodehouse's books perfectly. Even luckier, the source material is even more of a delight. Tightly plotted tales of posh, idle rich coves in the 1920s and '30s, charging about the place, getting into ridiculous scrapes thanks to their childlike behaviour and romantic entanglements, stuffed with language this richly witty, they're a delight to read.In this, the first of the full length Jeeves novels, the seemingly omnipotent valet has resigned from the Wooster household over Bertie's insistent banjolele-playing. Both men subsequently find themselves in the coastal village of Chufnell Regis, doing battle with pitbull-ish American yacht owner J. Washburn Stoker and trying to ensure Bertie's old pal Chuffy ends up engaged to Stoker's headstrong daughter Pauline (once briefly engaged to our hero and narrator, Wooster, while blacking up, dealing with protection racketeering children and sleeping in potting sheds.The Code of the WoostersBertie's criminal past (swiping a policeman's helmet on boat race night) comes back to haunt him when he gets embroiled in a contentious cow creamer collection rivalry between his uncle Tom and Sir Watkyn-Bassett, the gimlet-eyed magistrate who fined him a fiver for said outrage. Worse, he has to endure the ever-threatening Roderick Spode, the doe-eyed Madeliene Bassett , the spectacularly feeble yet briefly empowered Gussy Fink-Nottle, the scheming Stiffy Byng and her savage dog Bartholomew while a guest at Totleigh Towers, the country home of.... one Watkyn-Bassett.Again, it's all tremendous fun. Beautifully plotted and written, 'the Code...' is a superbly observed and narrated farce so beloved and influential that Tory MP Boris Johnson wholeheartedly (and cack-handedly) ripped off it's 'Eulalie' gag wholesale for his own execrable 'comic' novel, 'Seventy-Two Virgins.' Don't read that, by the way. Read this. And glory in the sheer joy of it all.The Inimitable JeevesThe weakest of the three novels, the third of them feels more like a collection of loosely interlinked short stories, most of them starring Bertie's old school friend and serial faller-in-love-r, Bingo Little with briefer appearances by our easygoing hero's light-fingered cousins Claude and Eustace. Of course, when reading a comic genius like Wodehouse, 'weakest' hardly implies 'weak'. There's gambling aplenty, whether it's at Goodwood, on the length of vicar's sermons, the mother's sack race or Bingo's romantic misadventures, some roaring about the metroplois with a bunch of communists, Bertie's ill-fated lunch date with Roderick Glossop (that confusingly pre-dates the events of 'Thank You, Jeeves') and, in the final chapter, one of my favourite passages of the whole collection:"Once a year the committee of the Drones decides that the old club could do with a wash and brush-up, so they shoo us out and dump us down for a few weeks at some other institution. This time we were roosting at the Senior Liberal, and personally I had found the strain pretty fearful. I mean, when you've got used to a club where everything's nice and cheery, and where, if you want to attract a chappie's attention, you heave a piece of bread at him, it kind of damps you to come to a place where the youngest member is about eighty-seven and it isn't considered good form to talk to anyone unless you and he were through the Peninsular War together." Classic Wodehouse! The witty and humorous Jeeve’s tales has the capability of making your day so much better! “The Jeeves Omnibus”, written by P.G. Wodehouse, is an exceptional collection of three humorous stories about how the problems of the comic English gentleman, Bertram “Bertie” Wooster, who lived on the inheritance of his family, are effortlessly solved by his highly educated and witty valet, Jeeves. Bertie never worked a day in his life, and spent most of the day shuttling between his London flat and the nearby Drones club for similar kind of gentlemen. The author developed the relationship between Jeeves and Bertie very well; every time Bertie was in the ‘frying pan’ with issues ranging from troubles with the police for stealing a constable’s helmet to being married off by the family to unsuitable girls, Wodehouse used highly evocative and comical language to describe how Jeeves prevented Bertie from jumping into the fire. For example, in the first story, “The Inimitable Jeeves”, Jeeves used a unique strategy to save Bertie from marrying a strong-headed girl with a love for the outdoors, Honoria Glossop (recommended by one of Bertie’s aunts, Aunt Agatha) by manipulating the fears of her parents about cats. Overall, I think this omnibus was truly a “good read”! My face aches from the many grins that erupted whilst reading this collection of Jeeves & Wooster stories. Wodehouse books are so much fun. Sheer escapism. Read the news and there's so much misery. Sometimes I need a splash of humorous brandy on some ice cold rocks of farce to cheer me up, like Bertie so often does with the real liquor in these stories. Some of these stories I have read three or more times, and I never find them stale. They're so well written.My only criticism of these collected volumes of Jeeves is that they're not in chronological order. So if you read this book from front to back, you'll find the stories at the end (The Inimitable Jeeves) actually take place before the events described in the first one (Thank you, Jeeves). My advice is to buy all five volumes of these Jeeves & Wooster stories, print off a chronological list - I got mine from Wikipedia - and treat yourself to hours and hours of amusement whilst reading all the stories in the order P.G.Wodehouse wrote them. One of my all-time favorite authors gifted us with the two most memorable characters of literary times: the clueless elite Bertie Wooster and his trusty valet, the incomparable Jeeves. Wodehouse has gathered millions of faithful followers through his collected body of work but especially through his deliciously satirical study of the lives of upper echelon of his time. This set is a comprehensive collection of the (mis)adventures of Wooster and Jeeves. This will introduce the reader to the entire set of characters that prevail through the Jeeves episodes. A must for anyone who fashions oneself as a dilettante at heart for rich language, fine humor and satire. Often dismissed by some as "mere" comedy, Wodehouse's works should not be underestimated as they remain a rich and worthy addition to the literary contributions of the 20th century. I thought when I bought these omnibuses that the stories would come in chronological order, but no such luck, apparently. Still a rather good read, though. Out of the three stories 'Thank You, Jeeves' and 'The Code of the Woosters' are the strongest ones, moulded along the same lines of conflict upon little conflict arising within a short time-frame, all coming to a happy conclusion thanks to Jeeves. 'The Inimitable Jeeves', on the other hand, flounders about somewhat, never quite finding its pace - probably down to the fact that this latter story was originally a semi-novel with eighteen chapters, but is normally published as eleven short stories. Still a good read, though, and one cannot help but be charmed by these stories that practically reek of tea, tweed, toast, and jolly old England. Well, I mean to say, topper stuff, and all that rot! I think with age I may have mellowed and change my whole perspective of the world. I remember trying to read these about 12 years ago and failing, miserably. In fact, I'm pretty certain, these were part of my "Bathroom" collection back then. The said bathroom was a cold gloomy affair in Castletown, Isle Of Man, so that may have something to do with it. 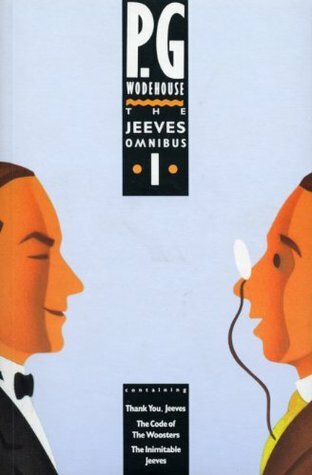 Anyway, I have finished the 1st Jeeves & Wooster omnibus and can, categorically say, I throughly enjoyed them. The 3 books in this set are not chronological and follow similar lines but are funny and farcical. This omnibus contains three short novels: Thank You, Jeeves; the Code of the Woosters; and the Inimitable Jeeves. Each novel follows Bertie and his valet Jeeves as Bertie gets into all kinds of escapades and Jeeves gets him out of them. Each story was very clever and had me laughing out loud. The situations would start off perfectly normal then get more and more ridiculous. The more ridiculous they became, the more excited I got to see how it would all turn out. Great for when you need something light and funny to read. If you want to read blisteringly funny dialogue and can overlook the period's prejudices evident in his writing, their is no one better to relax or enjoy than P.G. Wodehouse. This is my second reading of this volume of three stories. The final one, The Inimitable Jeeves, is my favourite. The others are longer and follow more traditional narratives, where as this is one scrape after another. That's exactly what I'm looking for from P.G. Wodehouse; fun galloping tales and brilliant dialogue, not impressive narrative. It's a nice and entertaining read, but my enjoyment has somewhat been spoiled by the TV adaptation. Fry and Laurie's portrayal of Jeeves and Wooster was superb, but I would have preferred to read the books from a somewhat more "unspoiled" perspective. Having said that, the stories are quite entertaining and a good read, although I wouldn't necessary class them as hilariously funny. Warmly recommendable, though. PG Wodehouse's well-meaning but 'mentally negligible' Bertie and his intelligent, formal valet Jeeves have long been an epitome of British humour. And, reading the stories, it is easy to see why. The plots usually involve Bertie trying to get out being married, being coerced into doing things, and Jeeves coming up with fiendishly clever solutions for the hapless young master's problems.I envy anyone who is just starting these books - they have a world of delight to explore. P.G. Wodehouse is one of the best authors I've ever read. I love the way he resembles the characters, especially the can't-say-no character of Bertram Wooster. My favorite character in this book is Jeeves. This book is a collection of 3 stories and Wodehouse, while he writes, actually paints a picture and in each story, we only see patches of it until the end of the story when we get the final picture. It's easy to see that the stories within the book were written across a length of time, and also that they're not published in the most faithful of orders (in fact the first story references events that happen in the third of the collection). Nevertheless, it was en enjoyable romp of a book, but not one I could read entirely in one sitting! I'm rating this already because I've read these before, years ago. It suddenly occurred to me it had been an AGE since I last read any, and that it had been my father's editions that I had borrowed and read previously. Thus I went out and bought this compendium of three of the Jeeves novels on Monday and have thoroughly enjoying it. Wodehouse is pure gold. Witty and quite, quite brilliant. Without a doubt my favorite (favourite?) British humorist of all time. I have all 5 Jeeves Omnibuses courtesy of Amazon.uk, since they're a bit tough to find on this side of the pond. And for one of the rare book-to-screen adaptations that actually works perfectly, check out the A&E/BBC collaboration with Fry and Laurie (although the third season is iffy). This isn't actually the edition I'm reading. I got some cheap-o version of The Inimitable Jeeves vols 1 and 2 at Powell's. Usually, I hate seeing tv or movie versions of books in my mind while I'm reading them, but I am actually a-ok with the infiltration of Fry and Laurie's voices and images in my imagination. god, i love wodehouse. i love bertie, i love jeeves, i even love aunt agatha. Good non-thinky stuff. A little dated and raciest and sexist but I guess that was the norm back then. I've read too much Wodehouse to list and my only regret is that he died in the 70s and there is no more coming. I say Jeeves, I bally well loved this book. Top literature right here.